When Missionday shared this book with me to review, they had one small request: “please identify at least one small choice that you will make differently to improve your health.” That’s awesome! The following review is my honest opinion; I will conclude this review with some small changes I’ve been making toward better help—inspired by this book. EAT MOVE SLEEP is a book of simple ideas that make a big difference. Author Tom Rath begins by sharing his personal story about being diagnosed with a rare genetic disorder that continuously produces cancers growths within his body. Being motivated by this, Rath has done exhaustive research through countless medical studies and journals to find the best way to strengthen his odds of living a longer, healthier, and more satisfying life. Rath simplifies his research into practical and—even more importantly—livable advice. The book is concluded with a thirty day plan and an impressive bibliography; the bibliography is so extensive, the 408 researched entries take up nearly half the pages of the book! Some other reviewers have stated that this book is “common sense” or “nothing new”. While partially true, I would suggest this is the most thoroughly researched and condensed book on this topic that I have read. What Rath provides is well-documented evidence followed by baby-steps of change. Instead of overwhelming the reader with fanatical expectations, readers are encouraged that small changes make huge differences. For instance, in one of his passages, Rath shows research that has concluded that our lives are shortened by 22 minutes for each hour of television we watch. He later shows that people that replace one hour of television with one hour of sleep will lose 14 pounds annually. Small changes; huge differences. The beginning of the book really captures the crux of the context. Rath’s later chapters plunge more into the periphery of self-maintenance. 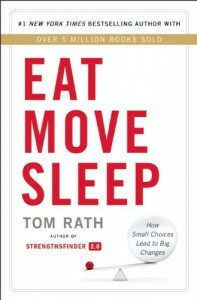 The later chapters may focus on such things like the health benefits of broccoli or the harmfulness of walking while texting, but Rath continues each of these chapters in the same “eat, move, sleep” format coupled with well-grounded research. -	Moved my water bottle behind my desk and put it on the window sill. Causing me to stand up, drink water, and look outside at the beautiful fall view. -	Watch out for sugar! It’s the season for candy, but now I’m motivated to avoid it—both for my health’s sake, but also for my energy level. -	Going to bed! 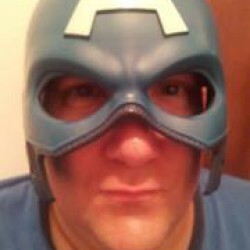 Even going to bed thirty minutes earlier has already had an effect on my energy level and disposition. -	Each day now, as I think about the eat, drink, move balance, I am thinking of new things—however small they may be—to incorporate into my daily, healthy living.